I’ve been busy this week, since tomorrow XP-Day Benelux 2003 is taking place. I did not know exactly what was going to happen this week, since this is the first conference me and my co-organizers put together, but I had a hunch it was going to be hectic. And it is. 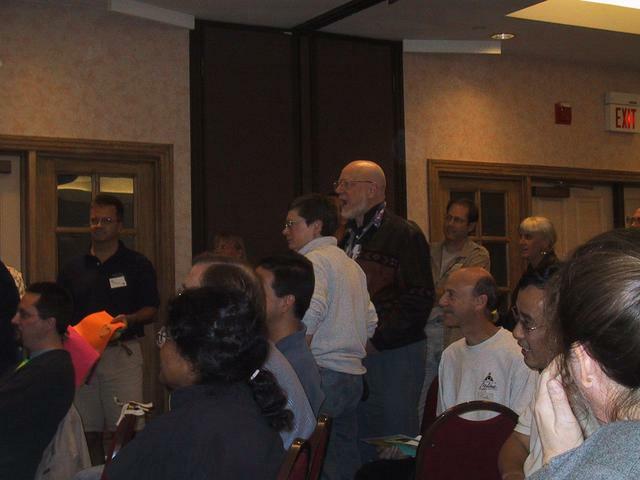 Modifying the conference program is quick and easy during a pc-meeting. 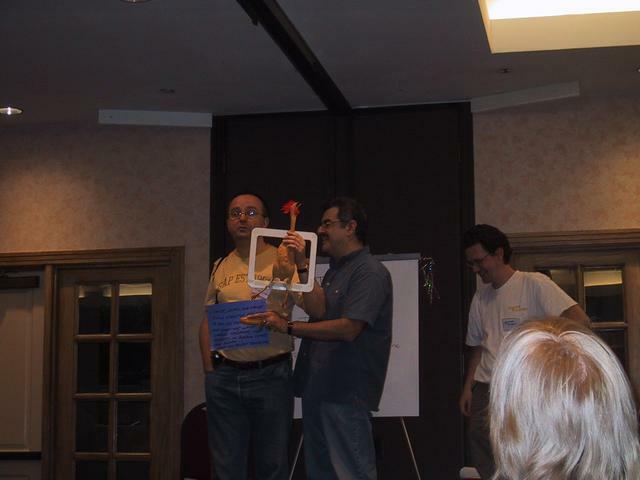 We take the latest version from our website (yes, the website is conventient for broadcasting the program to participants and session organisers), transfer it to post-its, and juggle around the program on a whiteboard. We then take a photograph of the end-result, and someone (usually Vera) ensures the broadcasted program reflects the one on the whiteboard. So, I’m almost off to the conference location, to do a last check of the rooms, the internet connection and maybe do some set-up work already. May-be I’ll see you tomorrow. I’ll put some pictures up somewhere next week. 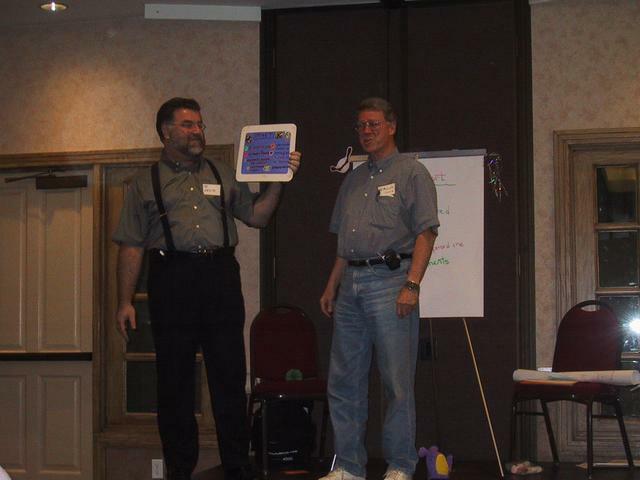 What stood out at “Amplifiyng Your Effectivess”? As you can see from my other entries, I was at AYE last week. I’ll try to summarize a number of sessions here. The sessions, are as usual, only part of what makes the conference. As Jerry Weinberg pointed out in both the opening and closing session, the most important people at the conference are not the organisers, but ‘the person to the left of you, and the person to the right of you’. I disagree sort of, since the organisers are also ‘to the left and right of me’ . A conference means to me always a 16 hour work day – 8 hours of sessions followed by 8 hours of dinners, lunches and drinks, and there was no shortage of interesting persons here. 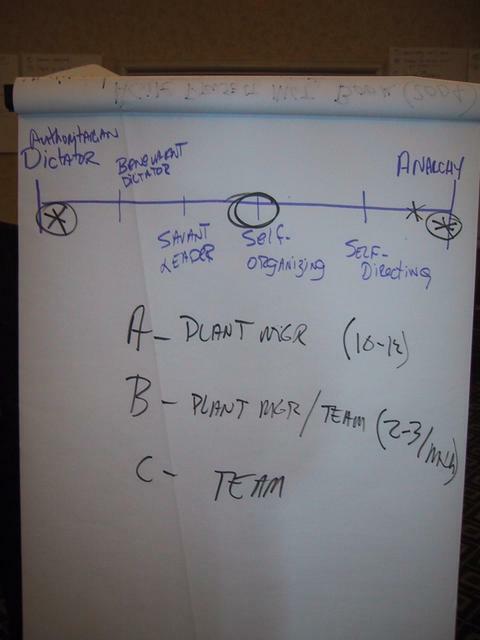 In a previous entry I already went into Jean Mc Lendon’s great session on Satir Systems Coaching, so I won’t repeat that here. The sessions below are the ones that stand out in my memory at the moment. This workshop facilitated by Joanna Rothman was interesting and practical. To the left and right of me were managers hiring people, as well as persons on the ‘other side’ of the job interview process, looking for work. Most hiring managers in the group were having problems with large amounts of applications for each open position. One has to strike a balance between the amount of time spent interviewing people, and the chance of a ‘bad hire’. Hiring someone you later have to fire is very expensive, in terms of both costs and morale in your teams. Having an HR department do screening before you as a manager with more technical and functional knowledge before you can seem efficient, but they can easily put off the best candidates, or fail to see through tricks by not-so-good candidates. Johanna recommended coducting so called phone screens, with the most important dissatisfiers early in the phone screen. A phone screen is a scripted telephone interview (in the same vein that is used for telemarketing). An example of a dissatisfiers is e.g. ‘are you willing to travel 25% of your time’ – if that is required for the the job and the applicant says no, you can end the phone screen right away (don’t forget to thank the applicant for their time of course). In 5 to 15 minutes you can quickly decide which persons you want to invite for an interview. We spent some time thinking about (il)legal questions. Surprising to me, the USA is quite highly regulated with respect to questions you can not ask. Whenever I met someone, they would often ask ‘where are you from’, and ‘where are you based’. In a job interview it is illegal to ask about the applicants place of birth apparently, whereas this is a default component of a Curriculum Vitae in The Netherlands. Questions about fluency in certain languages are only permitted if they are essential for the job. The group then did an exercise on Behavior description questions, these are a special kind of open question, asking the applicant to describe what he or she did in a specific situation in a past project. One can use these questions to find out relevant behaviour to the job in question, without spending too much time explaining about your current situation – job interviews are typically way too short to give both the company and the applicant sufficient time to go deeply into each-others’ situation. An example of such a question would be “What did you do last time you disagreed with a team-mate? With a Manager?” or “What did you do when a customer was dissatisfied?”. An interesting trick that came up, is the so called “dirtbag test”, to sift out the real assholes from the population…. If you want people in your organisation to respect each other, have a junior assistant call the applicants to verify something on the CV – if the candidate is not respectful towards the assistant, dismiss the application. Panel interviews may seem efficient ways to conduct interviews, but they are in fact the opposite. See for an amusing story and more details Johanna’s blog entries When Candidates Run Interviews and Panel Interviews. After the workshop I decided to pre-order some copies of Johanna’s forthcoming book Hiring Technical People, which looks promising, and useful to me when we decide to expand cq2′s software studio beyond our current network. or, Managing team membership, who’s in and who’s out by Becky Winant and Steve Smith. Follow the link to see photos by Steve Smith. The image above is of Team 1, my Team A was much less acrobatic, since we decided (it took me some effort to convince the others to do this ) to tear apart the flipover and stand on separate pieces early on. 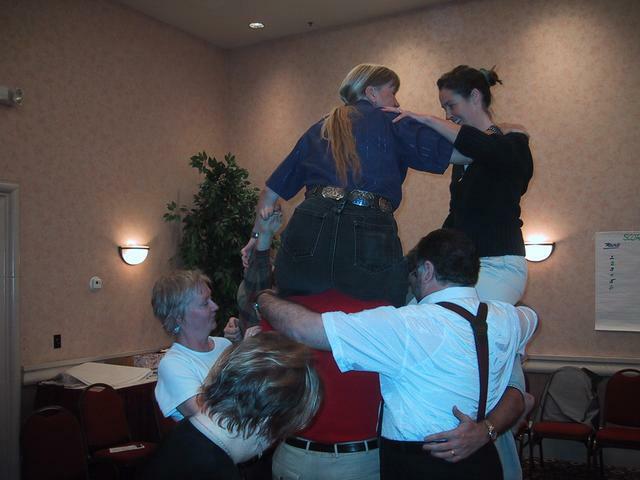 Eventually, it got to the point where there was of course not enough paper for everyone to stand on. So I was the first to check out (“I came here to stand relaxed on a piece of paper, not do acrobatics – I need a beer”) and go to the IFEP (Institute For Excluded People) where a bunch of Team 1 members had already gathered. Have regular person-to person meetings with those who work for you. Don’t do performance reviews once a year only. Don’t delay difficult decisions (one participant reported productivity of his team tripled after he fired a disfunctional team-member) – after you make the decision, it is likely that everyone will be relieved, even the ones you let go. Give advance warning, be specific in your performance targets & reviews. If you want to be an effective manager, don’t be afraid of firing someone – it is part of your job. I rembember most the three phase model for discussion, liberally translated in my mind as ‘diverge, argue, converge’. To come to a decision in the converge phase, one can take a vote, using a continuum from ‘veto’ ‘object but would not veto’, ‘?’, ‘agree with reservations’ to ‘fully agree’. Jim illustrated the importance of divergence with an example from Toyota, where they keep their options for a new car open as long as possible – until a car finally goes into production, they will develop more than one drivetrains, transmission, chassis and engine. This helps them solve problems with production – because not everything designed can be easily produced. If there is a problem with manufacturing, they can choose to one of the other options. The diverge phase is akin to brainstorming, because we don’t want to dismiss too many options. I am looking forward to reading Jim’s literature suggestion, “A facilitator’s guide to participatory decision making” by Sam Kaner, as well as the book Jim is currently working on, “Agile Project Management”. See the session notes for some observations of others on this session facilitated by Becky Winant and Jerry Weinberg. 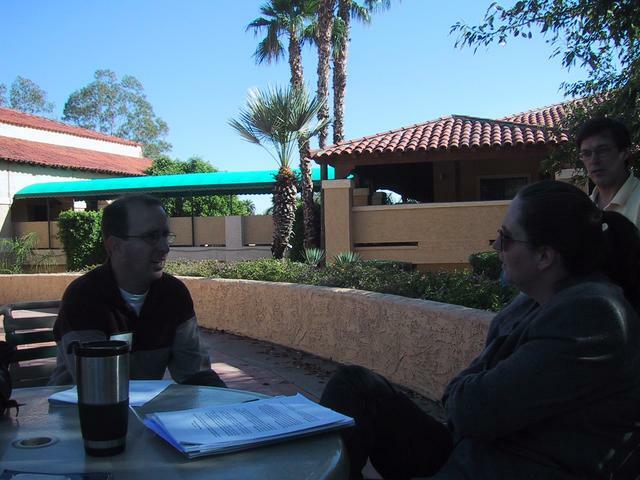 This session revolved around an exercise where a client had to get the best advice possible from a consultant, and the consultant had to give the best advice possible. The client and consultant were given instructions to this effect before the interview. Contrary to what is usual in this kind of game, the client and consultant were not given adversarial instructions. This didn’t help the client I was observing in the above picture… The client kept asking ‘are you the best consultant for this’, and asked a question about price in the first 2 minutes – this helped setting an adversarial athmosphere… In a sense this meeting between client and consultant was a success, because they quickly discovered they were not a good match. So, I learnt that I’ve become quite proficient at sales meetings, although venturing too far out in the unkwown can be risky. The observers told me I had been making good eye-contact (which i’ve been working on in the past year). Next time, I’ll ask even more questions. And finally, after Naomi appreciated the participants for several things, it is time to appreciate the organizers. 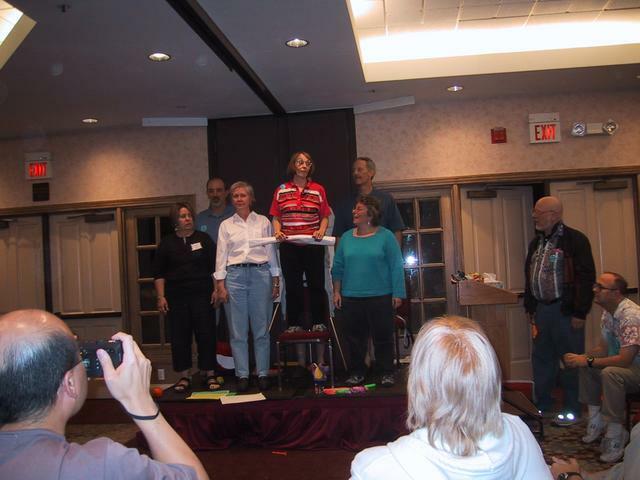 From left to right: Becky Winant, Don Gray, Esther Derby, Naomi Karten, Johanna Rothman, Steve Smith, and on the far right: Jerry Weinberg. Thank you for a wonderful time at AYE! What remains now is a few hundred photographs to sort out, cd’s with photo’s to send to several people and ‘compile’ all the events and, above all, , above all, to get some sleep. All in all it was a wonderful trip, the AYE conference, museum and historical site visits, and nature visites to Sedona and the Grand Canyon. Summarizing, I saw a lot of interesting sites, and met many interesting people, so the trip was more than worthwile. Luckily, I finally bought the cd ‘boy with the arab strab’ from Belle and Sebastian last week, that got a lot of play during long drives in northern Arizona, so that’s with me to keep up the atmosphere. The album is as good as most of the reviews had already told me, so I’m very glad with that. Unfortunately my brand new digital SLR camera broke down the day I went to the Grand Canyon (Murphy has to appear in my trips somehow), so I took some pictures with my older camera. 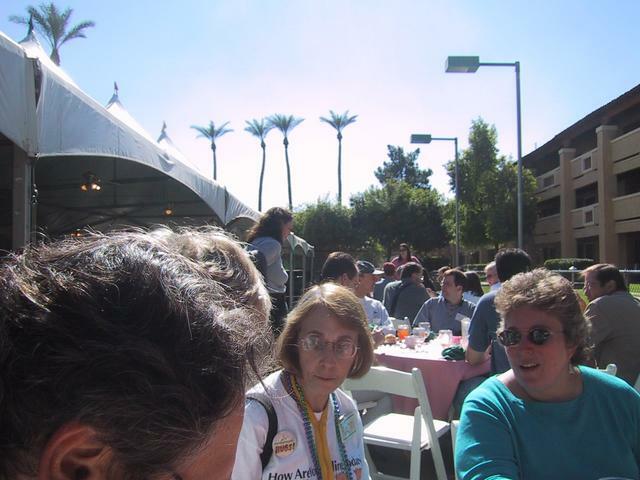 I am at the AYE conference in Phoenix, Arizona. Anko Tijman asked me to report about my experience at this conference. I’ve been in Phoenix since last thirsday, having a few days off to get in touch with the surroundings. That has been wonderful, maybe more about that later. I took some pictures in the corridor today. Here are Dale Emery and Laurent Bossavit, looking at the Birds of a Feather registration board. This is the Dorset House table, full of wonderful books. I didn’t take pictures at the workshops today, because I felt (especially at the Satir workshop), that taking pictures would be too intrusive. As I write this, I am at a Birds of a Feather session on Blogging (this column is a blog as well), with (from left to right in the picture) Laurent, Esther, Joanna, yours truly, Ron, Dale and Steve Smith taking the picture and Malcolm Currie… ). As a newbie, it is interesting to pick the brains of people who have been doing it for some time. Laurent asked an interesting question: ‘what stood out for you at AYE today?’. 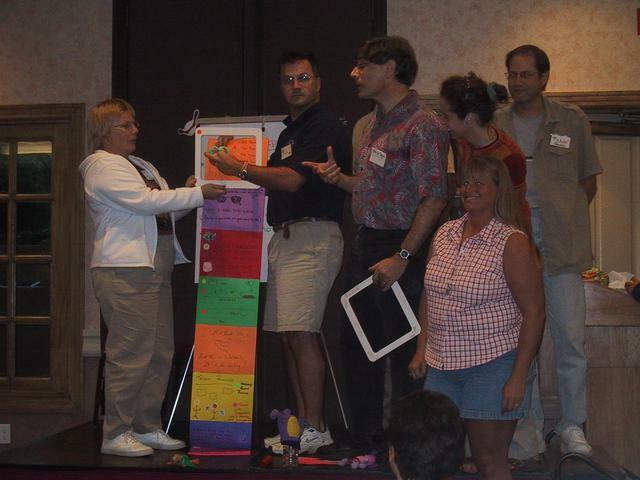 To me, it was Jean Mc Lendon’s experiential session on Satir Systems Coaching, showing what it is about by coaching one of the workshop participants. Part of the process was a ‘sculpt’, which is a kind of role-play in mime. The sculpt involved a family situation of the coachee, and a work situation, then both situations were displayed together, and Jean asked ‘what is different between those situations’, ‘what can you do now, that you couldn’t do before?’. As she had said in the introduction, private and work life are closely connected. You are currently browsing the me.andering – Willem van den Ende blog archives for November, 2003.